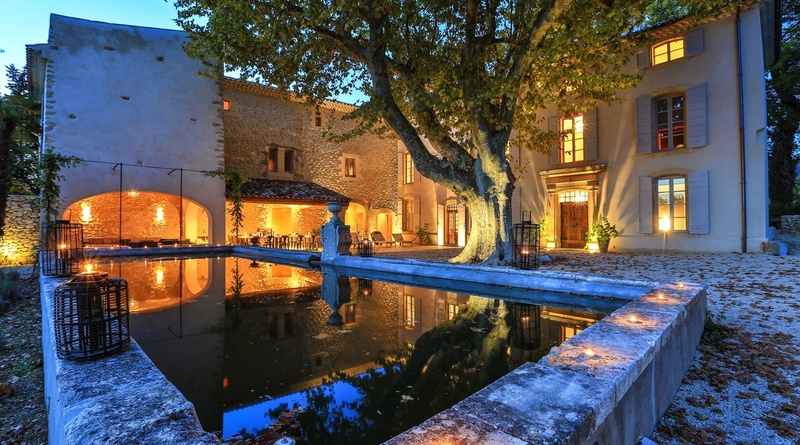 Located in the heart of Luberon, Bastide du Bonheur is an incredibly spacious estate that sleeps up to 34 people over 15 sumptuous bedrooms and suites. A luxurious residence that retains its traditional French features, the villa is a five-minute walk from Lourmarin, one of France's most picturesque villages. The town of Bonnieux is 15 minutes away by car across a tapestry of vineyards and orchards, while Gordes and Aix-en-Provence can both be reached in a 45-minute drive. Surrounded by 60 acres of private land and immaculate landscaped gardens, this is the ideal destination for travellers looking for seclusion and total escapism. Bastide du Bonheur is the perfect place for conjuring up a spirit of joie de vivre among close friends and family. The historic stone buildings offer ample space and afford a host of exceptional amenities. The main house comprises 12 bedrooms, while the second building on the site contains 2 en-suite queen-size bedrooms and one king, suitable for guests with reduced mobility or those in search of extra privacy. The outdoor space is a haven dedicated to rejuvenation with two pools, a spa, a hammam – or Turkish bath – and a massage table. A tennis court completes the picture, and the al fresco dining layout can host up to 34 guests. Spend hazy days meandering through the rolling countryside on horseback or mountain bike. Indulge your appetite for culture by immersing yourself in the galleries, boutiques and high-end restaurants of Lourmarin. Head to Aix-en-Provence to sample a taste of authentic local life at Les Deux Garcons, the region's legendary brasserie. Tackle the Route des Vins for a taste of the world’s finest wine, or simply bask in the warmth of the French sun on the poolside loungers. However you choose to unwind and recharge, Bastide du Bonheur will provide the ultimate Provençal getaway. Bedroom 6 - Queen bed with en-suite bathroom (Shower, sink, WC). Ideal for people with reduced mobility, or personnel. Bedroom 1 - Master bedroom with Queen bed and large en-suite bathroom (Shower, 2 sinks, separate WC). Bedroom 2 - King bed with en-suite bathroom (Tub, sink, separate WC). Bedroom 7 - King bed with en-suite bathroom (Shower, sink, WC). Bedroom 8 - Queen bed with en-suite bathroom (Shower, sink, separate WC). Bedroom 9 - Queen bed on mezzanine, sitting room, and separate bathroom (Shower, sink, separate WC). Access by a stoned staircase to the terrace and courtyard. Bedroom 10 - King bed (or 2 single) on mezzanine with a separate bathroom (Shower, sink, separate WC). Bedroom 11 - King bed (or 2 single) with en-suite bathroom (Shower, sink, separate WC). Bedroom 12 - King bed (or 2 single) with en-suite bathroom (Shower, sink, separate WC). Note: The two bedrooms with mezzanine can each accommodate 4 people (2 adults + 2 kids). Bedroom 3 - King bed with en-suite bathroom (Shower, sink, separate WC). Bedroom 4 - Queen bed with en-suite bathroom (Tub, sink, WC). Bedroom 5 - Queen bed with en-suite bathroom (Shower, sink, separate WC). Bedroom 13 - Queen bed with en-suite bathroom (Shower, sink, separate WC). Bedroom 14 - King bed (or 2 single) with en-suite bathroom (Shower, sink, WC). Bedroom 15 - Queen bed with en-suite bathroom (Shower, sink, WC). Bedroom 16, 17, 18, 19 : Bedrooms with large beds and en-suite bathrooms. Note: The main large pool is ideal for swimming and located about 75 m from the buildings. Beautiful views on the hills around. A smaller heated pool is set in the courtyard of the Mas la Romaine. Gym, Spa, Hammam, Massage Table. End of stay cleaning is included, as well as 3 maid hours per day hours (4 hours for 15 bedrooms, 5 hours for 18 bedrooms) per week. Please inquire for more maid hours. Linens changed weekly unless agreed otherwise. Maids not responsible for washing guest dishes/ pots/ pans or personal laundry. The village of Lourmarin is just 1 kilometer from the property. Small shops in the village,larger stores in Lauris at 10 minutes by car. There is a 15th and 16thc, castle that has peculiar stairs to see and magnificent apartments to admire (only the Renaissance part of the castle is open to the public). The inhabitants will want to remind you that Albert Camus, winner of the Nobel Literature Prize, lived and wrote here. In fact he was buried in the Lourmarin cemetary. In such esthetic surroundings and so lively an atmosphere, it is really the place to be in the Luberon in the summer months. Listed temple. Villa Medicis de Provence Castle (16thc,).